Later this week, Beau will be one month old (not sure how time flew by so fast). But I figure it’s about time to emerge from my cave and start getting out and about more and establishing a bit of a routine, which is as beneficial for me as it is for James Michael. I have managed to get out and about some with the boys, though most of the time I’ve had someone else with me. 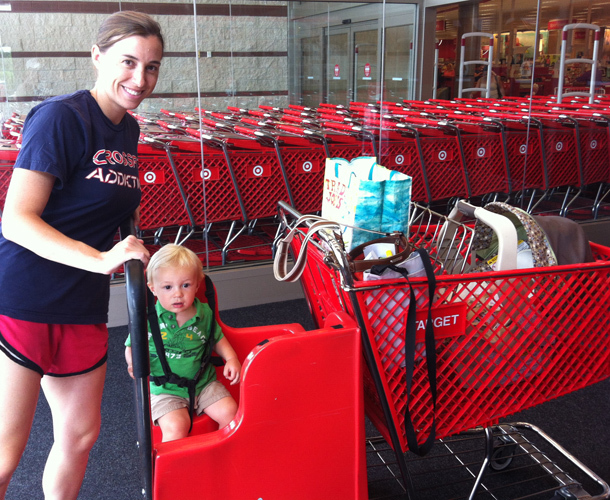 Thank goodness my sister came with me to Target because James Michael was into everything. And who can blame him because Target is awesome! I did take the boys to the mall by myself when Beau was about 2 weeks old because it had been raining constantly and little James Michael needed to get out of the house for a while. Despite it being a good outing with the two of them by myself, it reminded me why I avoid malls entirely. Next time I’ll come up with another option for rainy days besides the mall. I have a to-do list a mile long, and while that may not change for a while, there are other areas of my life in which I’d like to implement routines and habits so I figured I might as well start this week and slowly dip my toes into the water. Beau, who is more than 11 pounds according to my home scale calculations, has finally started spacing out nighttime feedings to roughly every three hours. I know that many babies start out with 3 hour feedings, but my boys like to eat so just getting him to 3 hour feedings at night is a big deal. During the day he still eats anywhere from 2 to 3 hours. Beau’s 3-hour nighttime spacing has given me just a tad more energy when I wake up in the mornings, so this week I’m planning to squeeze in a couple CrossFit workouts. I’m not exactly sure how or when these will take place, but more than likely I’ll work out at a time when James can watch JM and it’s cool enough in the day for me to take Beau with me to the gym (since CrossFit gyms don’t have air conditioning–or heat, for that matter). To say I’m excited about working out again is an understatement; I just feel so much better when I’m active and can work up a sweat. I know it will be quite a while before I build up my strength and endurance again, but I’m just excited to start the journey. After I had JM, I did my first CrossFit workout (deadlifts and burpees) at 4 weeks postpartum. This time I’ll be a couple days shy of 4 weeks after having Beau, but close enough. I have no idea what kind of WOD I’ll do. I’m sure I’ll ease into it with something simple and most likely scaled. I’m not into couponing, mainly because they don’t make coupons for fresh produce and meat. But one thing I do want to implement is weekly meal planning. I’d like to have dinners planned for the week and buy the specific ingredients needed at the grocery store in one weekly trip. I also want to base these meals on the weekly specials at the store. Meal planning isn’t hard, but it’s just a matter of dedicating time to do it. I’m hoping to use Sunday afternoons to plan out my weekly meals. I’ll plan to buy normal staples for breakfasts and lunches, and hope that we’ll also have some leftovers from dinners for lunches, or James loves to eat dinner leftovers for breakfast. 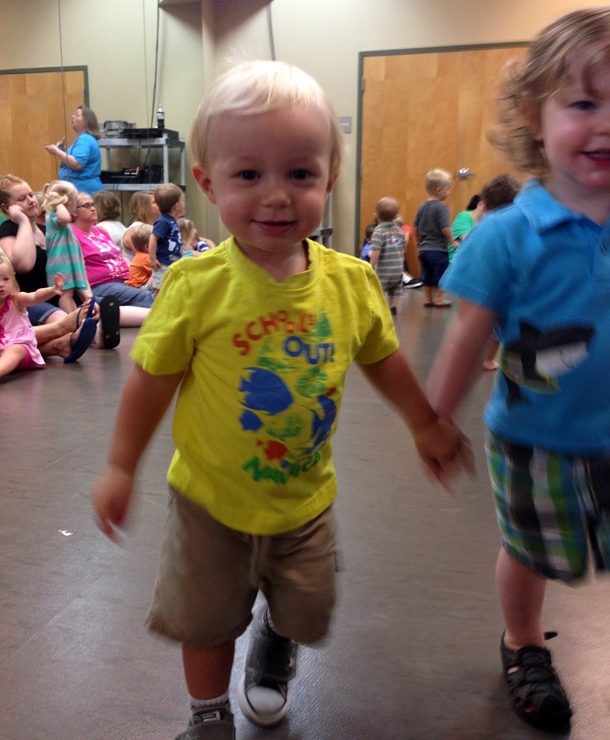 James Michael starts a half-day preschool program on Tuesdays and Thursdays at a local church soon. Because of this, and because it’s probably time anyway, I’m working to get him down to one nap a day. For a while, I need to have some planned morning activities for him, otherwise he’s not distracted enough when we’re at the house and he gets tired early. This week, I have two playdates planned for the morning as well as his meet and greet for preschool. And on Fridays we go to a local musical storytime that he loves. Regardless of eliminating the morning nap, JM absolutely loves social interaction, which is why I want to keep up morning activities even after he adapts to one nap a day. Some people may think it’s over-priced hoopla, but I recently ordered an Erin Condren planner and am so excited to get it in the coming weeks. I really wanted something to keep up with everything, as impossible as that sounds. I’m optimistically hoping this planner will do this and more. I’ve got a million written lists strewn around the house, as well as notes on my phone and events on my phone calendar. I can’t wait to put them all in one place to really get a grasp on what’s coming up for our family and what I need to do. Besides to-do lists and our family calendar, I also need to figure out a cleaning and laundry schedule for the new house. I’m hoping I’ll be able to get the majority of the chores done during JM’s preschool two mornings a week. Of course, I know I’ll also want to use that time for a quick workout, dinner prep and spending one-on-one time with Beau. So I think these first couple weeks will consist of me just figuring things out. And as much I just want everything figured out from the get go, I’m ok with easing into things slowly so I don’t try to do too much too soon.